Our Sunset Charmer is a classic San Francisco home in a quiet and pleasant neighborhood. The home which has been very well cared for offers lovely common areas with very comfortable bedrooms. The location is very convenient to the Stonestown shopping area and is within walking distance of San Francisco State and Lowell High School. The M Line of the Muni Metro is a five minute walk from the home. As you enter the home, you will find a charming living room, suitable for relaxing and for entertaining. The room exudes Old World charm. Adjacent to the living room is a small but pleasant dining room. The kitchen is tidy and includes all modern conveniences with extensive storage. There are two bedrooms located on the first floor and both have ample natural light. There is also a full bathroom. The second floor boasts a very large master bedroom with a bathroom en suite. There is a large garage which also contains the washer/dryer. Our Sunset Charmer is perfect for a family or group of friends. 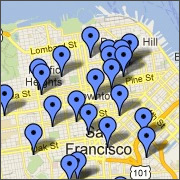 You can make yourself at home in the property but still access much of what San Francisco has to offer. Make your next stay a great one at our Sunset Charmer. ©2018 Buena Vista Vacation Rentals. All rights reserved.